If bougie food eateries are anything like college classes, it’s that you want to check the ratings before you even step foot into the establishment to avoid spending big bucks on something less-than-adequate. 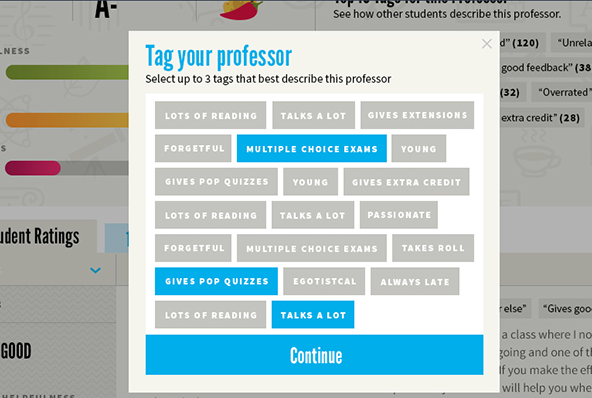 In the same way that Yelp provides reviews for all the latest and greatest restaurants, Rate My Professors affords you the same reviews but for your college instructors. Many students are familiar with the drill — come registration time, you scramble to choose the best classes. Sure, course availability could be a determinate factor, but what if this is just an annoying pre-requisite that everyone takes? Founded in 1999, the accessibility and usefulness of the website have amassed users throughout the world. 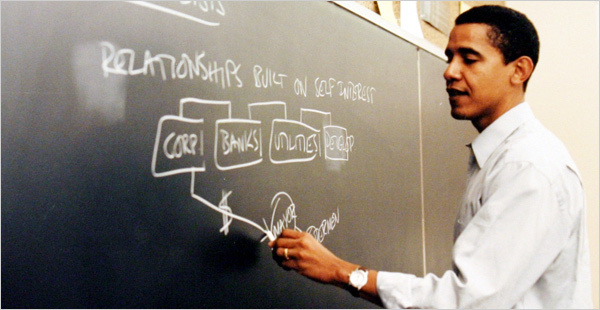 Because, of course, education is important and getting an A in that one macroeconomics class which could determine the entire outcome of your whole life is even more so. 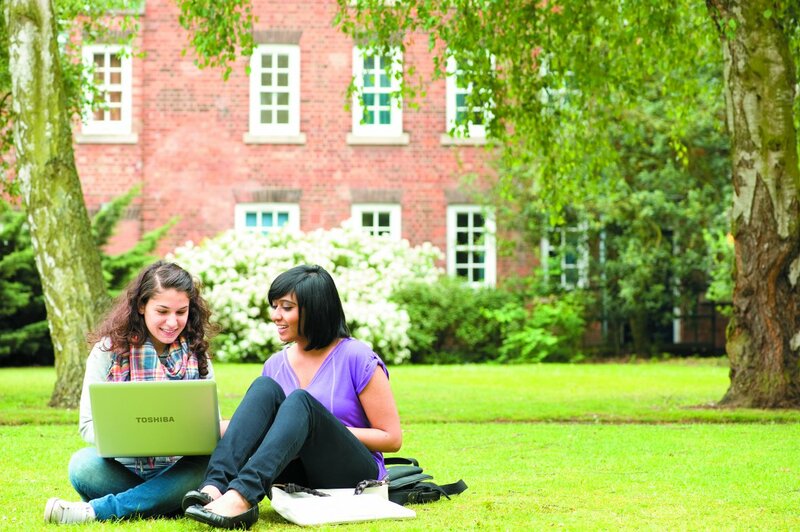 Part of its mission statement acknowledges that “Choosing the best courses and professors is a rite of passage for every student and connecting with peers on the site has become a key way for millions of students to navigate this process. The site does what students have been doing forever, which is checking in with each other — their friends, their brothers, their sisters, their classmates — to figure out who’s a great professor and who’s one you might want to avoid.” This seems all great in theory. Student reviews with explanations to help you better select the instructor tailored to your needs? Sign me up. However, there are some underlying implications of the whole process that carry significance in the college registration process. With anonymous student reviews, a culture of toxicity can breed online. Just look at all the online forums that attack a single individual with the mob mentality. It’s impossible to say if a group of extra-vicious students had a bad run-in with one instructor and have decided to slam him or her simultaneously on Rate My Professors. Also, because they are more informal than college-issued course evaluation surveys intended for the college’s personal data, students may feel that they can post whatever with little to no repercussions. While you are encouraged to back up your opinions by offering more insight in the free-response portion, college students can post virtually whatever, which may be highly subjective. In addition, it is common to find either reviews of high praise or of nasty slander. There’s really no in between, partially because the anonymity of the online forum means it more readily allows hyperbole. The other part is that most students would not bother taking time out of their busy schedule to write a review for a professor that wasn’t particularly memorable. As a result, you rarely see reviews for mediocre instructors, which gives an unfair representation of the instructor’s actual abilities and teaching style. The availability of the reviews can also be a cause for bias. The pool of reviews is usually not that immense. Some professors only have 3 – 5 online reviews while others who have been teaching longer or are more notorious may have a lot more. With that being said, it’s hard to gauge how true to life a specific individual is from his or her representation by only a couple of student reviews and even harder to make a judgment when you’re only reading about them through a computer screen. Because courses are highly subjective, it’s impossible to give a precise reading for a specific individual. Many factors come into play in holistically defining an individual, whether he or she is even a professor or not, and a 1 – 5 rating scale and 350 characters of response is not enough to determine a person overall. Furthermore, subjects vary immensely and (hopefully) professors have developed their own teaching styles to best instruct students. 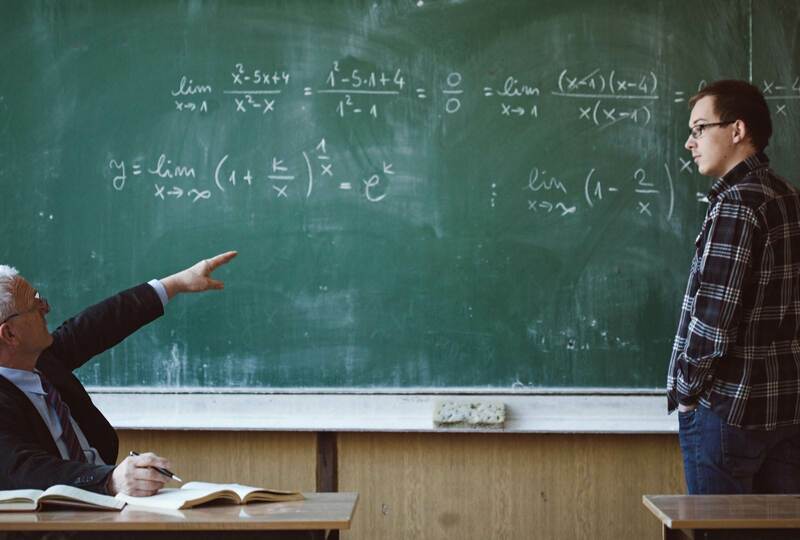 In some cases, some students may click better with a specific subject or they may find a professor’s teaching style misaligns with their preferred study methods, which isn’t an outright flaw of the instructor themselves. 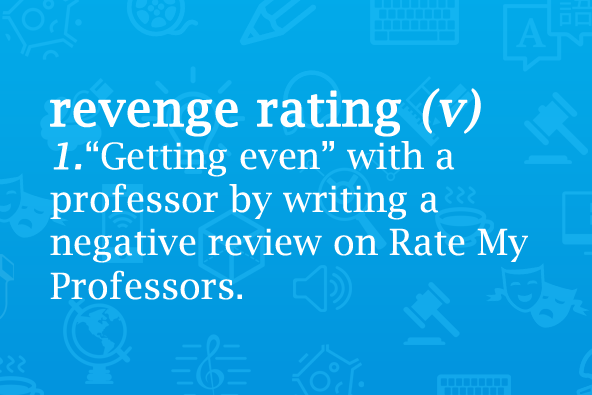 Another troubling sign is the growing increase in professors rating themselves on the site. Since it is anonymous and requires no real account, it is possible for anyone to log on and write the highest praise about themselves just to get a boost in rating and desirability. On the same thread, a student can purposely try to sabotage a professor’s overall rating (or vice versa) by posting multiple reviews for the same person. Because there isn’t a strong filtering system and because it is an open forum that cannot readily be subject to censorship for opinion, it is hard to gauge how accurate the responses are. Furthermore, the categories for defining an instructor are pretty vague. What exactly does “lots of homework” actually entail? How heavy exactly is “lecture heavy”? The subjective nature of these labels can create confusion and inaccuracy among would-be students. The reviews could lead to students entering the class with expectations that turn out to be wildly different from reality. Additionally, what constitutes “respected” for one professor may not carry the same significance for another instructor. 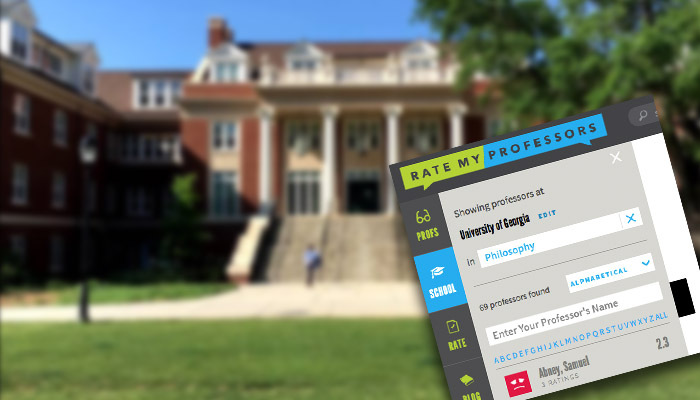 While Rate My Professors isn’t entirely horrible as it does provide some sort of baseline for gauging a rough estimate of a particular class or instructor, it does create inherent biases and inaccuracies in the overall grading of college instructors. Students should take caution when frequenting the site or should weigh these reviews with actual anecdotes from peers they actually trust. It should be used as a supplement for further research and the opinions must be taken with a grain of salt. Avoiding a class just because of a professor’s low rating online should be weighed against other factors, not just because an anonymous user posted one scathing response.